A friend called the other day excited about peeling up a corner of her wall-to-wall carpeting in her new condo and finding a wood floor underneath! She was ecstatic and couldn’t wait to send me a picture (it was Red Oak). Wood flooring immediately raises the value of your property most always in excess of its cost. Those home improvement shows on TV that have “stagers” prepare a house for sale are a good example. If they do something beyond a paint job and removing the clutter, they’re tearing out a carpet and replacing it with wood flooring. If they’re flipping the property, there’s a wood floor going in somewhere. Wood flooring is a universally recognized signature of quality. Check out the real estate ads in your town and see how often wood flooring is mentioned as a selling point. Her next phone call wasn’t as pleasant as she was in the middle having the carpet removed, and getting a firsthand experience of what that carpet was harboring. What she saw was bad enough, and what she couldn’t see was worse: colonies of dust mites. In fact, if your job was researching dust mites, and you wanted to create the perfect environment to raise generations of them, you’d design and build a carpet from the ground up. We get trade magazines that report on the entire flooring industry. Most of the contents are devoted to product categories we don’t sell, like carpet or plastic laminate. Given the lifespan of these products they’re destined to spend most of their time on this earth leaching poisons into a landfill. Some companies brag about they’re recycling efforts but there is none for laminate and the only use for recycled carpeting is as a contributing ingredient to the pad (which merely postpones the trip to the landfill). The magazine article about this subject explained that they’re not interested in your carpeting, so don’t expect a carpet recycling center in your neighborhood any time soon. They prefer a trailer load of the same stuff which can only come from large renovations like hotels or offices. So it’s high-end, commercially rated carpet, that’s been professionally maintained since day one. Here’s the punchline: 46% of the weight of the used carpet, is dirt! This is the most popular technique for simulating a foot-worn floor. When wood flooring was exclusively for the rich, and before drum sanders, a method of smoothing a floor was called hand-scraping. This made the wood as smooth as glass. The modern term “hand-scraping” has come to mean the opposite… and it’s a way of gently gouging the surface and edges of flooring planks to mimic the effect of a century or more of footfalls. Remarkably, most of this is in fact is done by hand. The result is that each board has a unique wear pattern. Wire-brushing mimics the accumulated effects that grittiness (like sand) has when walked on wood. The softer spring wood (the wider of the growth rings) wears off quicker than the harder summer wood, leaving a three dimensional texture that conforms with the grain pattern. Since all beach-front houses go through this history, wire-brushing often accompanies pigmenting the wood to various shades of white and grey. Those colors are associated with the long term bleaching effects of the sun (think driftwood). All lumber is “rough-cut” from a log using a circular saw or band-saw. These leave saw-blade marks that are routinely smoothed out in downstream production by planers and sanders. Back in the day when most wood flooring was used for its utility, and not additionally for its appearance, the flooring was merely rough cut lumber and those saw marks remained. Over time, much of that evidence is walked off, leaving only a suggestion of its history. This is the look targeted by manufacturers who employ this visual technique… remnants of saw-marks mixed with smooth. When most first floors sat over crawlspaces or dug basements, wood flooring went through some serious seasonal movement. Moisture from below swells the bottom of the wood and results in cupping. Cupping makes the top edges of the floor proud of the surface of the rest of the floor. This becomes a “corner” that your footfall wears down to a broken edge. When the floor flattens out, the edge is now softened (“pillowed” is what they call it in the industry). That edge was often dirtier than the rest of the floor, making each individual plank look like it had a dark border. This distinctive look is called a French Bleed. When fashioning wood was without the benefit of motors they weren’t interested for the sake of appearance in the extra effort, and waste, that results from excluding usable parts of the log. They exercised that discretion for fine furniture, but not for flooring. So color variation, knots, shorter pieces… if it functioned as a wood floor it was used. Many people prefer the presence of these features in their wood floors… these highlight the fact that every piece of wood is unique to all the world and all of history. Because of the excess movement, sometimes these planks cracked in place and manufacturers have even found a way to mimic that history also. The first stuff to be applied to wood for the purpose of preservation was most likely a plant-based penetrating oil. These finishes are still used today and in Europe they protect about half the wood floors in service. 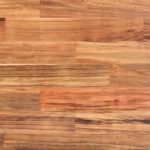 Planet Hardwood holds an inventory from two of the leading flooring oil manufacturers… still plant-based (and VOC-free). One can buff a penetrating oil to a “glow”, but never to a “gloss”… in other words, the appearance of a penetrating oil is never shiny. Even a shiny finish will lose its glossiness over time with use, and that’s “history”. A low gloss level can be achieved with a variety of finishes… not just a penetrating oil. Woods like American Chestnut and Longleaf Pine are no longer commercially available from the forest. They either succumbed to an imported blight (Chestnut), or were overharvested and never replanted for the purpose of timber (Longleaf). The only modern source for these species are from reclaimed structural timbers remanufactured into flooring. They have a history by definition. These were virgin first-growth trees hundreds of years older than the average age of a modern harvest. The growth rings are tighter and obviously more numerous. Additionally, their service as structural timbers can include other evidence of history like nail-holes or a patina. We buy recycled wood flooring by the flatbed to serve it up at a reasonable cost. Planet Hardwood shows a wider variety of these wood flooring choices than any showroom in America. No fooling! Check the jobsite for conditions that will result in excess moisture or high humidity. Surface drainage should be away from the house. The slope should be minimum 6″ in 10′. Gutters, drains and downspouts should be unclogged and functional, draining water away from the house. Eave overhangs should be sufficient to prevent rain from flooding the foundation. If there is a crawlspace, it must be cross-ventilated with a total ventilating area exceeding 1 1/2% of the first floor area, with no dead air spaces. For example, a 2,000 sq. ft. crawl space must have 30 sq. ft. of year-round open venting area. If the ground under the house feels damp, or is giving off excess moisture, lay a 6mil. polyfilm vapor barrier on the ground in the crawlspace below the installation area. To acclimate or not to acclimate? The reason for wood to be in the environment of the occupied building prior to installation is to “acclimate” to the prevailing relative humidity (RH). Wood is hygroscopic, that is, it acts like a sponge, either soaking up moisture or giving up that moisture to a drier environment as it arrives to a balance with its surroundings. This balance, where the wood is theoretically inert, is called the “equilibrium moisture content” (EMC). Wood flooring adds value to your home and is an investment, not an expense. Look at the real estate ads and count the number of times hardwood flooring is mentioned as a selling point. Now compare that to carpet or laminate. Carpet and plastic laminate are disposable floors, whereas wood flooring lasts for centuries if properly maintained, and can be returned to brand new condition. Wood flooring does not harbor allergens like animal dander, fleas, ticks, mites, or hold dirt like carpet. After a few years, nearly half the weight of carpet is accumulated trapped dirt. Job-site applied oil or water based polyurethanes require sanding off old finish and reapplying a new finish on unfinished an unfinished wood surface. Some of the wood surface will be sanded off as well. Factory applied finishes are compatible with the common water-based acrylic polyurethanes now widely used in favor of oil- based finishes. So a re-coating no longer requires the factory-applied finish to be removed, but merely abraded sufficiently for the new finish to adhere. This is much less of a mess than a full sanding, and does not remove any wood from the surface of the flooring, unless you’re dealing with dents. Different woods have different degrees of hardness and density which will affect how they look over time. Eastern White Pine, the softest wood used for flooring, has in many cases withstood over 200 years of use and abuse. You’ll never “walk through” a wood floor. 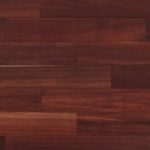 Hardness and response to moisture are individual to each species, and these properties are important considerations when choosing a wood floor. The hardness of wood is measured scientifically by the “Janka” test. This test measures the pressure it takes to sink a .444 inch steel ball one half its diameter into the surface of the wood. A higher number denotes a harder wood. Woods that are naturally harder than others will show less dents and evidence of traffic, but this relative standard is mostly for cosmetic reasons as all wood floors will last hundreds of years before they are worn through. Aging gracefully: wood and sunlight. “Country” grade is generated exclusively for Planet Hardwood as a function of a mill’s broader production. In other words, it is only available to us on an accumulation basis and not on an order-driven basis. Because the deal is so good, we get as much as we can, when we can, but there are often gaps in availability. Please check with us before budgeting. Any domestic specie in any width is our open purchase order with the mill. It’s cheaper than a quality laminate and it’s a solid wood floor!